By today’s standard of fame, you don’t need to be in Hollywood. With the existence of the internet and the popularity of social media, you can now be YouTube famous, Vine famous, and Instagram famous. When he worked at Viacom, Grant noticed that with media companies, advertisers paid for TV content. This idea stayed in the back of his mind for a while as he moved to Venture Capitalists and built a company. Until he realized that there is still no media company that caters to millennials leveraging all creative and original content. Thus, he founded and created SENNA, an app that aims to create a native experience of digital media for different platforms. The idea is to create an archive for the social media famous on outlets such as Vine and Instagram, and creators of memes and pop culture terms such “bae” and “twerking”. Grant noticed that although these individuals do manage to establish large followings, they still suffer from lack of distribution. SENNA is natively built for mobile experience. It allows you to find and follow these people, and search for videos and music. So instead of going to multiple platforms and having multiple apps open, SENNA will all these in one place. “We’re going to be distributing content to wherever there is internet connection,” he says. 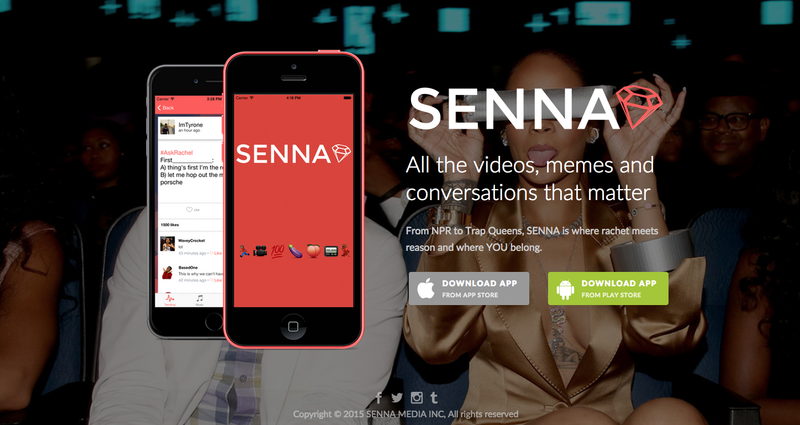 SENNA stays away from the paid view model, and instead going down the road of native ads. They are also working with several influencers and taste-makers. Their largest opportunity would be with social commerce, where plenty of transactions are done online. SENNA aims to make transactions like this easier. Although they are focused on their mobile version at the moment, Grant is open to creating a second-screen experience for SENNA users.